Elegance and power to release your creativity. 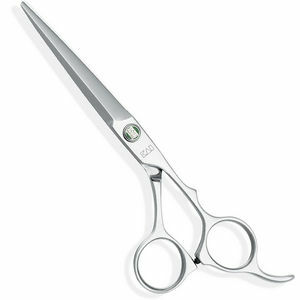 The latest addition (spring 2017) to Kasho's range, the Kasho Sagano Series, combines some of the best features of their Green Series scissors with the tension screw from the Damascus Series, all wrapped in an elegant design for a look that's all its own. The Sagano Series' handles follow the semi-offset shape of the Green Series for a comfortable feel that combines the ergonomics of the offset shape with the classic feel of level handles. Completing the handles is a flowing, forged finger rest (the first time that Kasho have used one of these in their scissors). The blades have a sword shape that helps channel power into every cut and feature the high-performance, hollow-ground, convex edges that makes cutting with Kasho scissors a legendary experience. The Sagano's blades are joined by the adjustable flat-screw system used in the Damascus Series. Not only has this proved highly reliable, it also features an integrated ball bearing which makes the action unbelievably smooth. The screw itself is inlaid with green ceramic with white lettering spelling out Kasho's name and Japanese characters for a touch of understated sophistication. The Kasho Sagano is available in 5.5, 6 or 6.5 inches. £690.00 (inc. VAT) Why no VAT? We're a trade wholesaler and quote our prices without VAT to help our VAT-registered customers understand the true cost of a purchase. Real leather scissor cleaning cloth, that'll care for your scissors and keep them cutting beautifully for longer if used regularly. Genuine leather protection for your scissors. Measures: 12.5 x 4 x 1.5 cm.